Ollie Shilston has raced all over the world and enjoys racing in all sorts of varied conditions. He has worked as a beach lifeguard for 16 years (8 years with the Royal National Lifeboat Institution (RNLI)) and is now helping educate beach users on SUP safety. Paddling safe is an important subject. 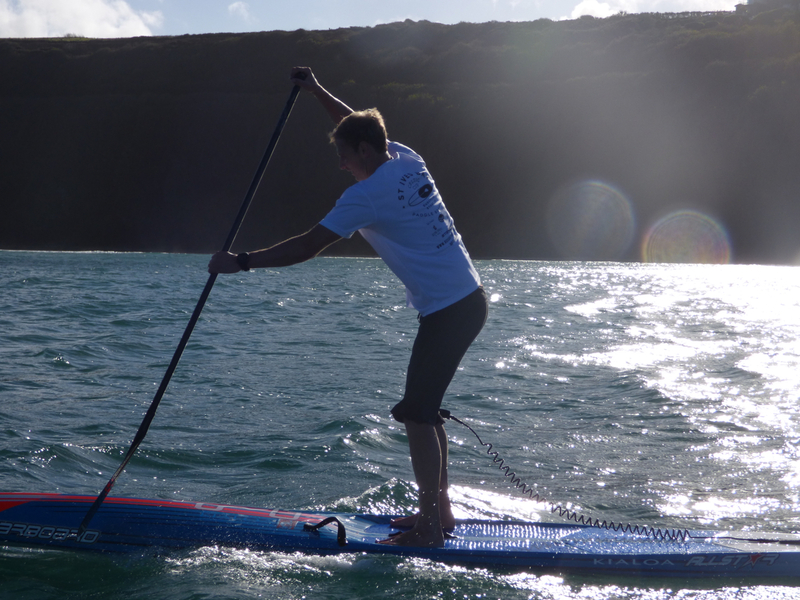 With increasing interest and participation in SUP the RNLI is working with groups such as British Stand Up Paddle Association (BSUPA) and local communities as part of the charity’s ‘Respect the water campaign’ to bring awareness of the safety issues related to the sport. Tip 1 – Wear suitable clothing for the time of year, including a personal floatation device and be aware of the effects of cold water shock. Cold water shock has particular risks for Stand Up Paddle Boarding, as the activity generally means paddlers are on top of the water and not in it. This has a greater difference in temperature between the two. As you are usually pretty warm when paddling most people aren’t always prepared with the right clothing. This can also have more of an effect when entering the cold water. The effect on the body of entering cold water is often underestimated. The shock can be the precursor to drowning. Anything below 15oC is defined as cold water and can seriously affect your breathing and movement. With average UK and Ireland sea temperatures at just 12oC, and rivers such as the Thames being colder even in the summer, the risk is significant most of the year. Cold water shock causes the blood vessels in the skin to close, which increases the resistance of blood flow. Heart rate is also increased. As a result the heart has to work harder and blood pressure goes up. Cold water shock can therefore cause heart attacks, even in the relatively young and healthy. This can all happen very quickly: it only takes half a pint of sea water to enter the lungs for a fully grown man to start drowning. You could die if you don’t get medical care immediately. It’s very important to use a leash. Not only is the leash attaching you to a large buoyancy aid (i.e. your board) it’s also vital that you are a responsible paddler that looks out for the safety of other water users. A paddleboard is a big and potentially dangerous piece of equipment when loose in the surf. A leash gives you some control over your board when you fall off. Some SUP’s are heavy and purpose-made leashes must be suitable for the weight and force exerted upon rider and board. A rip current is a body of water moving out to sea. Rips can be a way to get out to the back line of the surf however they have to be used with caution. Rip currents cause 60% of surf rescues. The best way to avoid rips is to choose a lifeguarded beach. Lifeguards are trained to identify rips and mark out a safe zones based on the sea conditions. They can also spot you more easily between the flags, should something go wrong. If you do find yourself in danger, never abandon your board. It will help keep you afloat and make you easier to find in the water. If caught in a rip, don’t panic! The SUP rider should stay calm, signal for help and hold onto their SUP board or anything that floats. If possible, ride the rip out and paddle perpendicular to the pull of the current (usually parallel to the shore) until you are able to stand or stop feeling the pull of the rip current. Use the waves if possible to return to shore. Stronger paddlers should paddle at a 45degee angle across the rip. This will enable you to get out of the rip quicker. There is a national flag code on beaches throughout the UK. Red Flags – Indicate that, in the opinion of the lifeguards it is dangerous to bathe. This may be due to large surf, strong rips, seas fog, thunders storms and questionable water quality. Red and Yellow Flags – These indicate the patrolled bathing area and is considered to be the safest area by the lifeguards for swimming and bodyboarding without fins. Black and white Flags – They indicate the area of the beach designated for large craft. 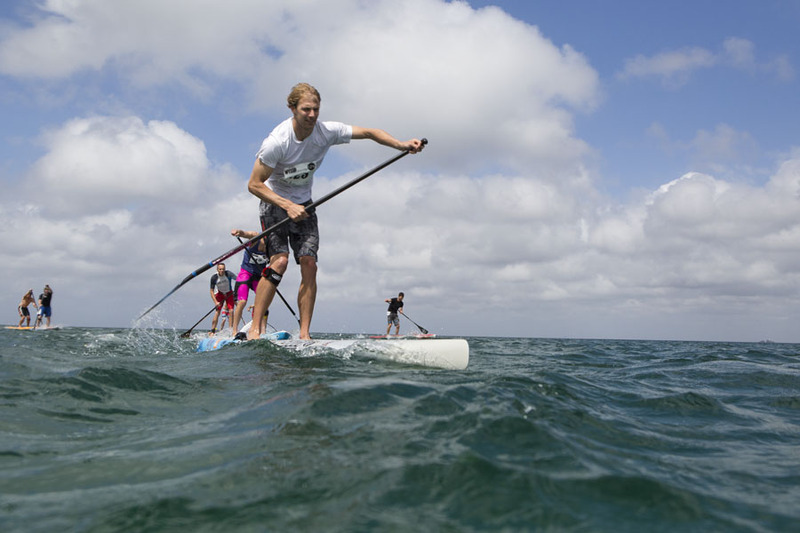 SUP riders should launch and recover between the black and white flags and be considerate of other water users, by learning the rights of way in the surf. This can save you and others getting injured. Experienced Stand Up Paddle Boarders will take note of the prevailing currents, the locations of rips and wind direction. When properly considered, all of these factors will help negotiate the surf. Before entering the water always make a note of a landmark, which can be observed from the water and used as a guide to maintain a fixed position. Also take note of who’s around you. A quiet area with plenty of space would be the best option. When proceeding out through the surf, negotiate the shallows by wading to a depth at which the paddle can be used adequately. There’s no point jumping to your feet in the shallows and being unable to paddle correctly. Consider paddling out prone (on your belly) with the blade of your paddle under your chest and shaft and handle sticking out over the nose of your board. Tides have a reputation for being unpredictable, but really they follow a timetable more reliable than most trains! There are two different types: spring and neap. Spring tides have greater range between high and low water, so at high tide the water comes in further up the beach. Neaps have less variation, so at high tide the water won’t come in as far. This is an important issue to think about when paddling, the bigger the tide the more currents and water move around making it more difficult to paddle. Finally, it is essential that you always tell someone where you are going out and when you’ll be back so that they can raise the alarm if you don’t return as planned. Don’t leave the house without a mobile phone or communication device. SUPing can be great fun, but remember as with any watersport it can be potentially dangerous too if not taken seriously. So before you take to the water, take a moment to plan your paddle, and make sure you’re prepared by considering Ollie’s top tips. All very valid points. Thanks for sharing Ollie.